The study analyzed 212,672 unique tweets generated by 57,049 unique Twitter users. Of these tweets, 2,658 were geo-tagged. 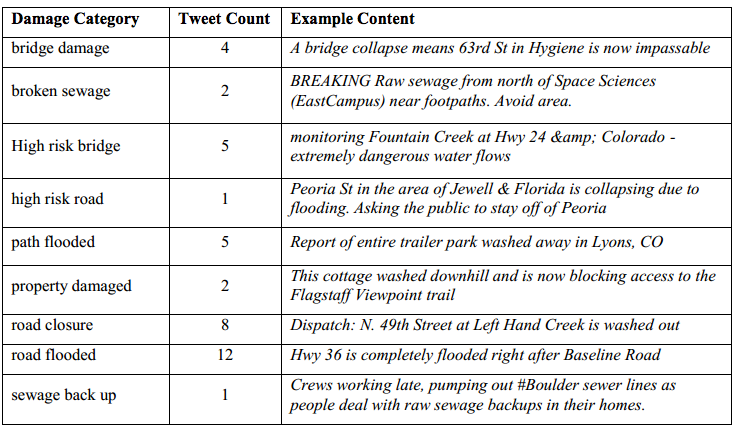 The researchers combed through these geo-tagged tweets for any information on infrastructure damage. A sample of these are included below (click to enlarge). Leysia et al. were particularly interested in geo-tagged tweets with pictures of infrastructure damage. These findings are an important contribution to the humanitarian computing space. For us at QCRI, this research suggests we may be on the right track with MicroMappers, a crowdsourcing (technically a microtasking) platform to filter and geo-tag social media content including pictures and videos. MicroMappers was piloted last year in response to Typhoon Haiyan. We’ve since been working on improving the platform and extending it to also analyze UAV/aerial imagery. We’ll be piloting this new feature in coming weeks. Ultimately, our aim is for MicroMappers to create near real-time Crisis Maps that provide an integrated display of relevant Tweets, pictures, videos and aerial imagery during disasters. This entry was posted in Crisis Mapping, Crowdsourcing, Disaster Resilience, Humanitarian Technologies, Social Media and tagged Colorado, floods, MicroMappers. Bookmark the permalink. While I agree with the concepts outlined in the article, I think that as the initiator of the Humanitarian UAV Network, any link to the one-sided IEEE article re the Falcon work and the USG “freaking out” should also reference the airspace restrictions at the time and the ongoing rescue operations in that airspace. While the aerial imagery is absolutely valuable, publicly disparaging the importance of other components of a response is not a way to create positive relationships within the emergency management community. I’m not sure I’d hold this up as a good example of UAV imagery operations. Thanks for reading and glad you agree with the concepts outlined since that was the point of the article. I frankly wrote this up very quickly and didn’t have the time to read through the IEEE article carefully. I simply assumed that IEEE is a well-respected scientific community. Please send me a few links that provide a more balanced overview of what happened re the UAVs and I’ll add those to the blog post. Again, I want to be clear that the focus of the blog post is on the concepts and not at all about the UAV operation itself or any controversies around that particularly data collection tool. Thanks again for reading.